Randy is a lifelong lover of the outdoors and especially camping. 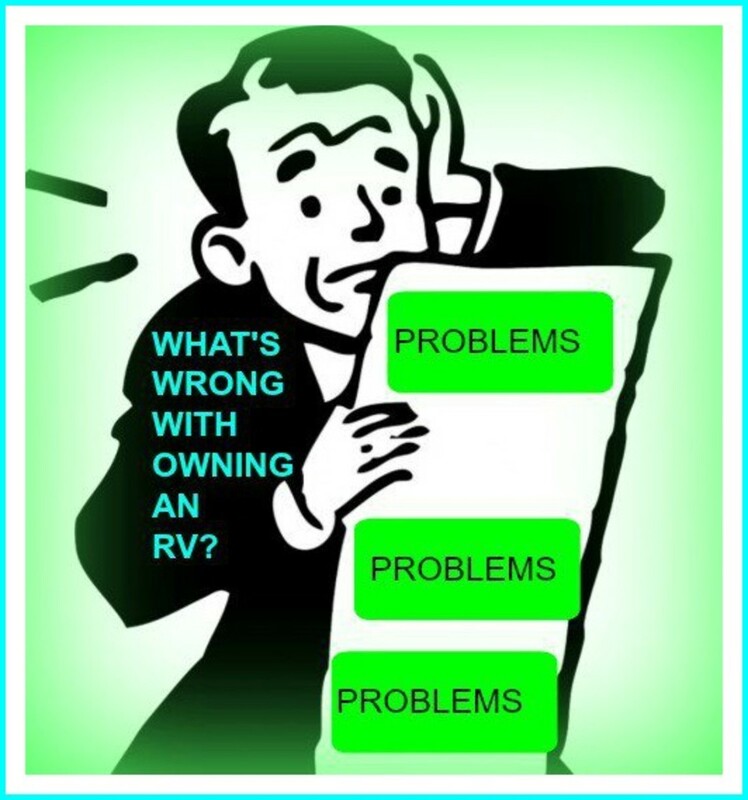 His articles are intended to help the RVer save money and time on repairs. Many of us cannot afford those fancy motorhomes and luxurious travel trailers even though we do love to visit America’s great state and national parks. 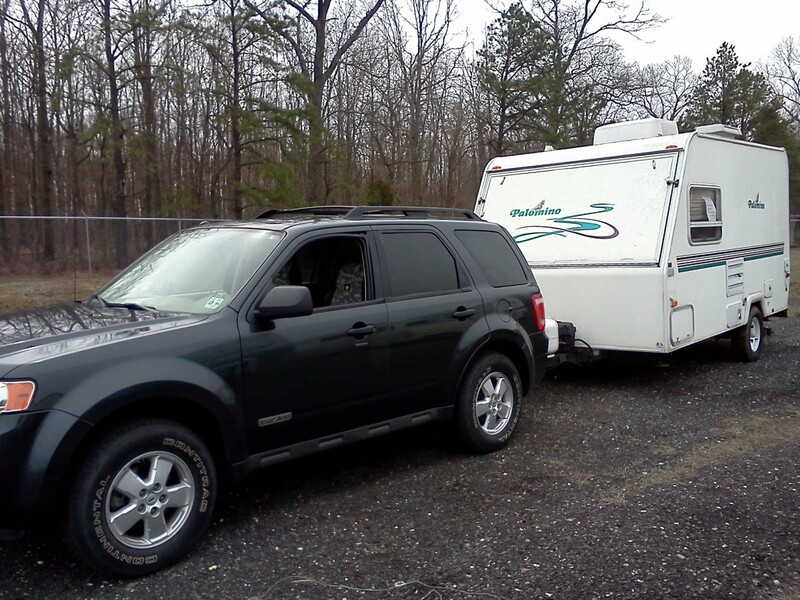 Fortunately for us DIY types, there are many used or classic travel trailers and other types of campers for sale that merely need a little fixing up and modernizing to make them comfortable and safe for our families to enjoy. 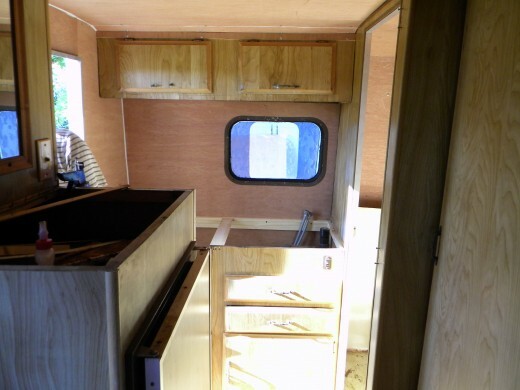 This article describes the renovation of an 86 Nissan Nicky mounted camper body that had only been used for a couple of camping trips. The engine and interior of the truck itself were in great shape, with only 38,000 miles on the odometer. The camper body itself, however, was in very bad condition due to a roof leak which caused much deterioration to the interior. Damage from leaks is a very common problem in old RVs. As you can see by the photos, the ceiling and walls, as well as the sink and stove area, were all badly damaged. 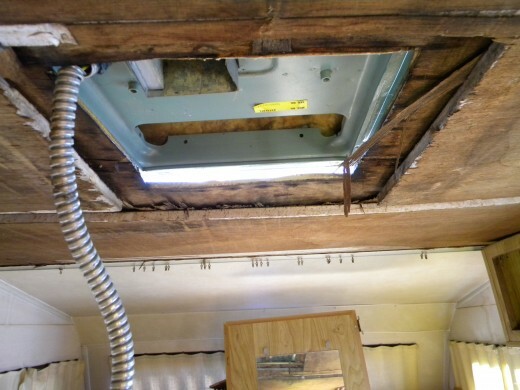 The structural integrity of the camper walls and ceiling were at risk also, as the wood used for support was badly rotted and would have to be replaced to restore stability to the RV itself. But since the RV cost only $400, I considered it well worth repairing. We started off by giving the little unit a thorough examination in order to make our materials list. The secret to doing a quick and reliable repair job on any travel trailer or motorhome is to plan ahead and save trips to the hardware store. At least when you remodel a motorhome instead of a house, you can buy your materials in smaller quantities: wood paneling, screws, nails, glue. 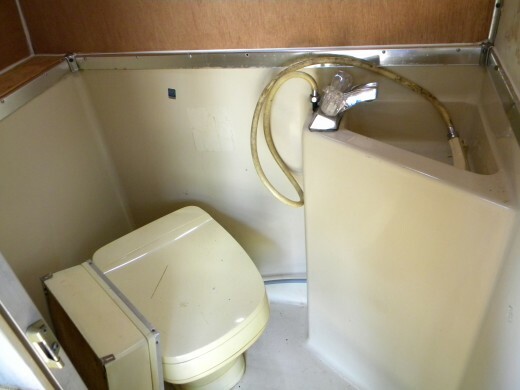 Plumbing: Many older RVs may be updated by using the newer flexble tubing plumbing to replace old copper or PVC water lines. One advantage of flexible pipes is that they stand up to the vibration of a moving vehicle. As a rule, an old toilet is easier to replace than to fix. Electrical system: A new breaker box (with more breakers) is also suggested for very old travel trailers, because microwave ovens and other new appliances may require more amps than the old breaker panels were designed for. Adding extra 110-volt receptacles in the kitchen area is a good idea; it's better than having to run extension cords across the limited floor space in most RVs. 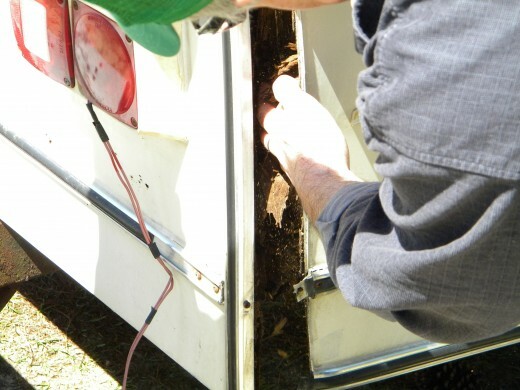 An old three-way evaporation refrigerator can be replaced by a new efficient 110-volt model (as described in this article on RV repair) for great savings. The roof seams were bad and would first have to be resealed and coated to prevent even further interior damage before beginning the repairs. We began at the top, to see where the water that had caused so much trouble was coming from. We removed the ceiling assembly and hold-down bracket from the Coleman rooftop AC unit so we could better access the roof and ceiling damage. One of the bolts securing the rooftop AC to the hold-down bracket was loose and this may have been the cause of the leaking roof. But the damage was so bad that it was difficult to determine exactly where the leak originated on the roof. We did determine that the roof seams were bad as well, and that before we began other repairs we should reseal and coat the roof to prevent even further interior damage. Damaged ceiling caused by the leaking roof. The entire ceiling needs recovering and bracing up. This camping unit, like many made today, relied on Styrofoam panels for much of the roof and walls, with this particular model using wood panels glued to the Styrofoam to give structural support. The old roof was made of 4x¾' Styrofoam sheets with 2x2" wood rafters. As we describe below, we used luan as a replacement. We decided that when we replaced the ceiling we would add four pieces of angle iron as rafters to add strength to the 4 x ¾” ceiling boards we replaced. This added support would keep the AC unit from bouncing and reopening the roof leaks. The stove and sink area is in pretty bad shape. They and the cabinet will be removed to get to the rotten corner braces on the rear of the RV trailer. 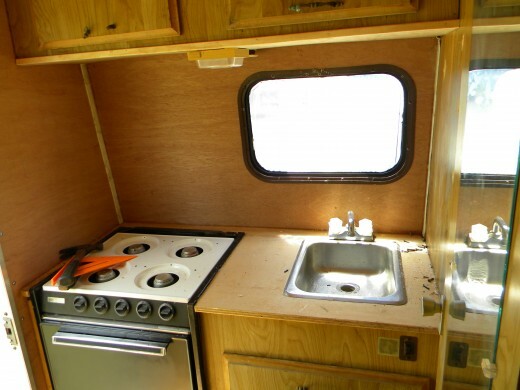 The walls and countertops also would need recovering or replacing in the little motorhome. The water damaged the counters and other parts of the kitchen. What's more important, it damaged the wood corner supports, which were behind the kitchen cabinet and in the bathroom near the stove. We needed to access and replace these rotten corner wood supports. Furthermore, we wanted to replace the floor with new plywood. So we removed the stove and sink from the cabinet, as well as the cabinet itself. All wiring over the stove was detached until after the job was completed. This is recommended for all electrical wiring you may encounter during the repair process. 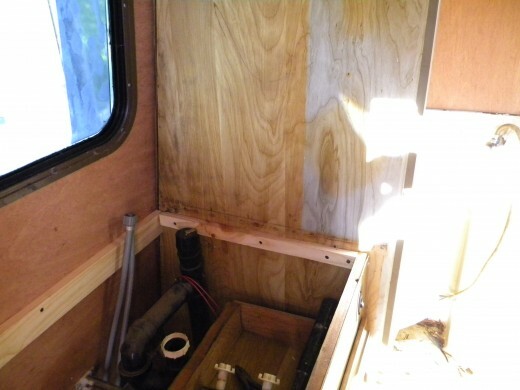 The wood corner supports in the rear of the camper were damaged. This is directly behind the stove and sink area. Water damaged the supports at the corner of the RV. After we removed the AC and stove/sink cabinet, we replaced the wooden corner braces. With the AC ceiling assembly and hold-down bracket removed, the damaged ceiling is ready to be removed and replaced. After we removed the AC unit, we inserted the four pieces of angled steel into the ceiling, attached them to the replacement ¾ x 4” ceiling joists, and covered them with new luan paneling. A view of the refurbished ceiling with the AC reinstalled. Ready for painting. After the ceiling was repaired, the roof seams were covered by a strip of roof repair aluminum backed with a very sticky adhesive. It is sold as “Peel N’ Seal” in Lowes or Home Depot. This is a wonderful permanent or emergency repair roofing product which pays to have along on any camping trip. We then coated the roof with a rubber-based roof sealant ("Kool Seal") to ensure against any possible new leaks. We removed and discarded the original panels attached to the corner supports--thin styrofoam and luan—and replaced them with new 1/4" luan. Luan is a soft plywood made out of tropical deciduous trees. It can be stained or painted. 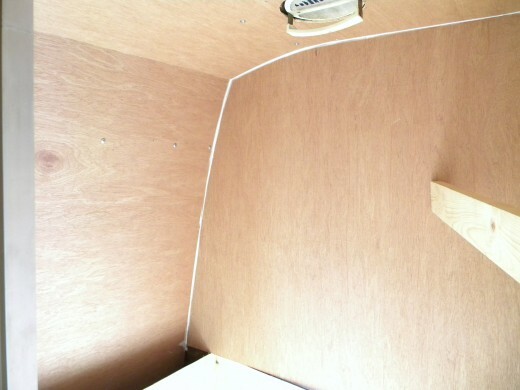 Since it's thin it is great for bending into the curved shapes many RVs use for the interior ceilings and walls. It paints or stains great too. 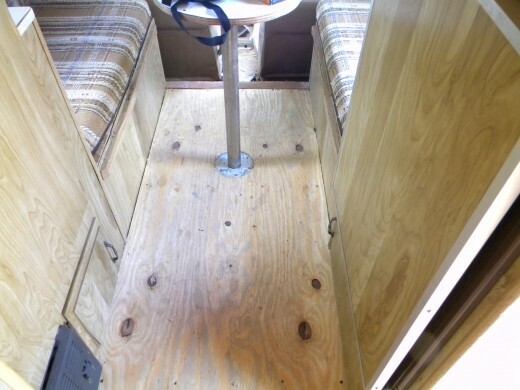 You can use Liquid Nail or a similar adhesive liberally to connect luan to wood, and for other repairs on RVs and travel trailers. As an alternative to luan, you can use thin sheets of paneling turned inside-out to display the wood-grain side. These sheets are occasionally offered at clearance prices at Home Depot or Lowe's building supply stores. 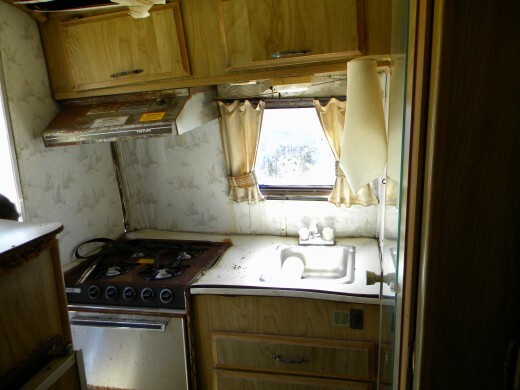 As you can tell from photos below, the new paneling did wonders for the badly damaged interior of the RV. We used 1” or 1 ¼” drywall screws to attach most of the paneling and hid the screws with molding strips. In more visible places, we relied on finish nails and more Liquid Nail to ensure a tight, long-lasting seal between the luan and the wood supports. A view of the new ceiling and rear wall during the restoration process. Replacing cabinets after rear wall and support braces were repaired. The sink and stove area before reinstalling the countertop. We checked the plumbing and electrical system in the sink/stove cabinet area and added a new 110-volt receptacle to replace the rusted unsafe outlet beneath the overhead cabinets. We cleaned up the stove, sanded it, and painted it with high-temperature paint to resist the heat from the gas burners on the stove. We reattached the gas lines and sealed them properly during the reassembly. New luan paneling was used above the shower surround in the small bathroom. The new paneling will be finished with water resistant paint. The small bathroom shower unit was fine, but we replaced the paneling above the surround with luan paneling, along with the ceiling and walls. 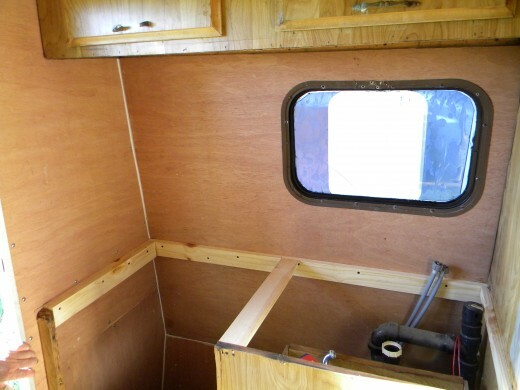 The paneling above the surround will be painted with a water-resistant paint, which should do fine for the occasional weekend trips planned for the small camping unit. Although the floor was not completely ruined, an extra layer of plywood was added to ensure a solid floor. We decided to add an extra 3/8” layer of plywood to the floor area for added strength, even though the floor was still in usable condition. Often, a water-damaged floor will continue to deteriorate from foot traffic and will eventually give problems if not recovered or reinforced properly. 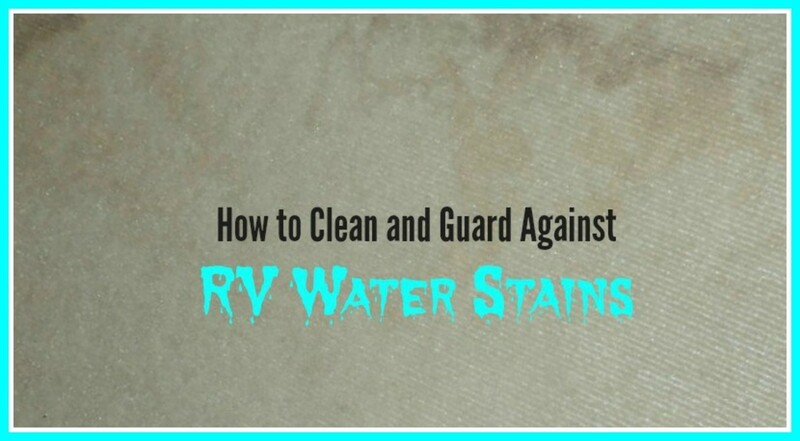 If you have had serious water damage, you can completely replace the RV floor. Refurbished stove and kitchen area. All plumbing and electrical lines reattached. Renovated bath area, also ready for the paint finish. New plywood counter tops and wall paneling complete the renovation of the motorhome. Through With This Guy! Road Ready at Last! There’s nothing as satisfactory to a DIY guy than seeing the results of his own work. The roof and walls, along with the ceiling and bath repair, turned out great and should last for many years to come. There are other small areas which need a little spit and polish, but this little camper is now ready for the road. The owner decided to paint the interior himself and save a little more money, which was fine by us. He still came out smelling like a rose though he hired us to do the work for him. Besides, we hate to paint anyway. The owner now has about $1400 in this neat little rig and could sell it for much more than he invested if he so chooses to do so. The repair methods used in this article may be modified according to your own taste in design or the depth of your wallet. We chose the most economical materials while maintaining durability and safety as much as possible. Don’t be afraid to take on one of these projects, as the labor is not too time-consuming nor the materials too expensive. Almost anything you do wrong can be repaired with no problems. Good luck with your own project and thanks for reading my articles on RV repair. Cheryl, visit a local body shop and ask them what they use to remove decals without hurting the paint underneath. They may even give you a wholesale price for the remover. I don't have any experience using the ZEP product but you can always try it on a small spot to see. You may also consider putting a more modern decal in place of the outdated one. I bought a 86 Fleetwood lynx 5th ...The owner started but didn't not finish the renovations. He fixed all the wiring and plumbing. All the panelling is in a pile inside the RV ....the toilet isn't hooked up but it s there. Reinstalling the toilet should be straight forward enough that I can let my husband do it without him messing it up to badly (he isn't handy at all). I had a dad who thought I should know who to fix well just about anything lol. what I need to ask is I need to spruce up the outside of the RV. What can I do about the sun baked 30 year old paint/decal that runs along the body up to and on the RV door,the door is fiberglass and the body is metal I believe. Should I try repaint this by hand using painters tape and spray paint or should I just remove the paint/decal ...I want to remove it and be done with it..those decals scream the 1980. What should I use to remove the paint/decal that is 32 years old oringnal factory sun baked faded and peeling off of two different surfaces? Ace, it depends on how much time you have to complete the repairs, and the expense as well. However, if you do the repairs yourself, you can rest assured they're done well and also design the camper yourself. Be sure to look at junkyards at auto supply places which sell used parts. Some of the parts you may need are almost brand new and you can usually get them very cheap. As I said, you' guys will have to make the call! Hi Randy, a friend of mine bought an rv/trailer. I'm not sure what type or year but that its about 30 ft. I plan on helping out with them but the wood is all rotted and so theyve gutted everything - walls, floor, everything. It needs plumbing and electrical work and upgrade. We've got furniture, cabinets & a new bathroom/shower/toilet. Is it still possible for us to keep working on it? I heard it may be expensive, maybe as much as $15-20k. Is it worth it? is it possible? or would it just be better to buy a new one or something. help please. Sorry Sandra, 3000 miles is a bit far for me to recommend anyone's work. Chris, feel free to ask for advice when you need it. Hi Randy, thanks for a really informative page! I have a 1987 RV with water damage to part of the overhead cabin. Some but not all of the wooden framing (looks like 2 x 4 studs) and plywood paneling has rotted - maybe about 40%. Do you think it is sound from a construction point of view to cut out and replace only the rotted parts? Or would it be better to replace the studs and paneling in whole sheets? Maura, look for RV parts online. There should be many options to choose from. 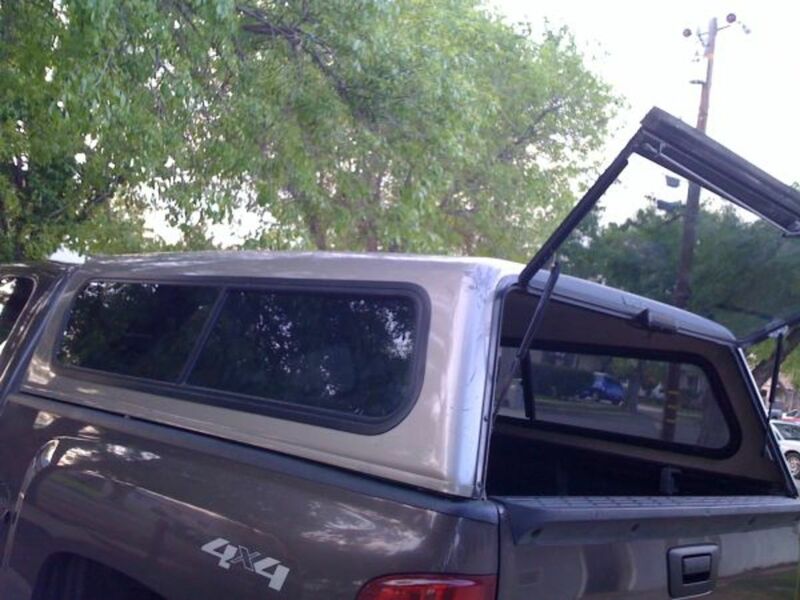 We are looking to do a new build truck camper, where can you get the camper windows? Hey Randy, I've been following your RV articles, looks like the sweet spot as far as what people are always searching for online, must be a lot of RVers out there! Congratulations on 10 years! (I saw you mention on another post) and multiple millions of views! Marissa, I don't think there's any asbestos used in the construction of your camper. At this time they used plywood or particleboard for most of the flooring. And yes, you can use peel and stick tiles if the flooring is relatively smooth and clean. Also, your page is very informative. Ive found myself back to this one several times now. Thanks for that! And asbestos testing here in canada is $300 ish...maybe its better to just put flooring over top of my current flooring. I can just put peel and stick over the linoleum-couldnt i? It doesnt have to be perfect. Just pretty. I have a 1972 holiday rambler...im worried about asbestos...does anyone have one similiar or know anything about whether they had asbestos in the flooring??? Daily, if you have a rubber roof it may need replacing. A metal roof can be coated with a rubber based sealant found at any Lowe's or Home Depot store. We just bought a 5er and noticed water damage in the main bedroom slide. When we checked the roof we noticed the seems were badly dried and separating, now we have to focus on fixing that. Did you reseal the exterior portion of the roof? If so, with what material? Kathy, Anyone who has a basic understanding of carpentry can do this sort of repairs. Perhaps you can find someone to advise you step by step for a low price. Lucinda, you can find some rebuild books on Amazon. I once had some on this page but the editors removed them for some reason. Hello there, I Inherited a 5th wheel from my sibling and want to refurbish it. I'm pretty handy, but I want to do some research, to determine whether to try tackle the task myself or pay to have it done by a pro. My question is would you recommend any books or videos about restoring 5th wheels that I could read to help me determine to DIY or handing it over to a pro.... Thanks!!! Do you know of any resotation companys? Fort, never tried this, but it should be possible. Sorry, I've retired from such activity these days. Sorry Abel, I'll look around and see if I can find some helpful info for you. Randy, Winnebago purged all the specs for models prior to 1985. Chances are slim I find someone that was around 74-79. Maybe someone here has dealt with this. Hi Abel, pleased to hear form you again and sorry you have been ill. I don't have any idea what sort of adhesive the makers used for this application. Have you queried the company yet? I havent been here in some time. Cancer has ruled everyday the last 6 months. First is to wish you a MERRY CHRISTMAS and a Blessed 2019. 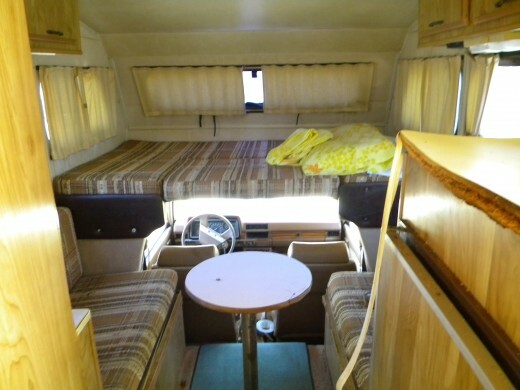 I think I posted a pic of my 1978 Class A 23' Itasca. Heres a link. Have you ever had experience with an adhesive Winnebago used on the bottom aluminum cap on the lower portion of the wall, I would call "the skirt. Winnebago did not any fastener only this adhesive generously! A PO used all kinds of screws when this aluminum cap loose. Due to this, it caused water damage as the lumber wicked up the water. I have started demo at the door, as it is the most in need of being repaired correctly so door will close tightly. Whatever this adhesive is aged past it life and I dont particularly want to use "Hard as Nails" and fail. 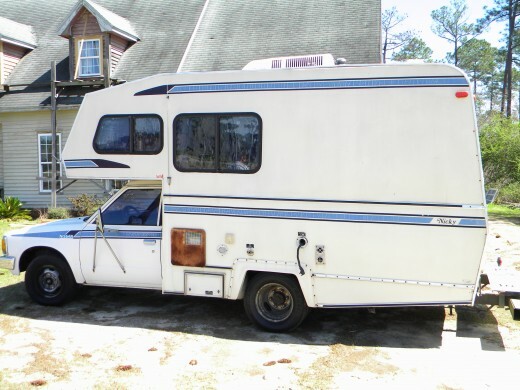 I am slowly reworking a 1985 Jayco Mini 25 . Thanks for the ideas from your Nissan repair. I ripped out nasty old carpet and am replacing with vinyl plank . Your floor reinforcement will solve the problems smoothness of the floor because of the mounting bolts on the floor for the steel. Buck, I have no experience with spray foam in a camper. As you say, it needs to flex while in transit. 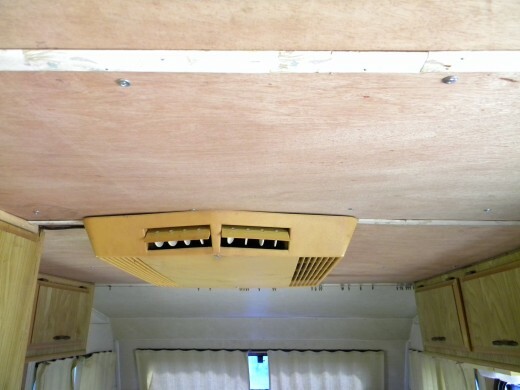 Can you spray foam the walls and ceiling of an old camper? Or will it make the walls and ceiling to stiff. I get the feeling a camper needs to flex when heading down the road. I have some ideas now for mine. An 87 Vanguard that I bought this year. KrazyKora, Unless you can contact the maker of your camper, then I don't know. Most campers and RVs use a similar wiring diagram for both 12 volt and 110 volt systems. Great article and information. I am new to RV/Travel Trailer life and remodel. How do I find a manual that has electrical and plumbing diagrams for my 74 Prowler? dragonart, you have a choice of paneling over 2x2 studs or there are other wall coverings you can use. looking to replace everything walls floor ceiling. got this camper for 200$ all dry rot inside and meldu i am wondering the type of walls i use on this its old and needs work. Thanks for the reply Randy, hope all is well. Yes I was asking if there should be a gap between the sheets or if they should be directly butted against one another when used as wall panels? Also, I plan to use 3/16 luan and directly attach them to the studs. Is this what you did, and if so what did you use to attach them? Becky, it'd be best if you moved it before the gutting, but if not, be sure to brace it well before the move. Sorry to be so late in responding, Nate. Hurricane Michael knocked my power out. By spacing, do you mean the gap between the panels? I use 3/16 or 1/4 thick x 1 or 1 1/4 wide wood strips to cover the seams. What spacing should be used between sheets of luan used as paneling? Also, how did you cover the seams between sheets! Rickson, I don't see why not. It would make the construction easier and stronger at the same time. If I wanted to build a permanent "tiny home" out of my old 34' trailer, could I rebuild the inside framing with 2x4 construction and 4" of closed-cell spray foam insulation in walls, ceiling, and floor? This would be very energy efficient, but it would add considerably more weight than the original construction. However, the trailer would never move again. Your thoughts? as far as i can tell painted aluminum its not in the worst condition but defiantly saw its prime about 10 years ago so i wanna do everything i can to extend the life of it. im thinking im going to seal all the seams from outside i can find. Then glue frame to aluminum then seal inside then insulation between framing then lauan. Connor, you never apply a sealer to wood you plan on gluing. Doing so will prevent a proper adherence of the glue. What is the exterior composed of? Im doing a complete demo of a camper with a friend to share. we will be gutting the entire thing to as basic a form as we can get it. My question is we want to re seal the entire thing to pervent as much future damage as possible. Were planning on gluing the framing to the metal then screwing into the framing for roof walls ect. Would we put the sealer on then glue to that or glue the framing then seal everything? Im worried if i seal then glue the framming will just rip the sealer off and fall. Also what would i do to maoe sure im also sealing the outside? Pamela, using 2x4's may make it a bit heavy for the frame. What was used originally? Hello, I have a 1978 prowler that is 24 ft. It is a complete tear down.Would it support a two by four frame.It has double axles.I hope this is the right question. Tara, is he sure there wasn't a cap on the new H/W outlet? Sometimes there's a plug in the connecting pipes. My father replaced the water heater a month ago. Everything works “fine” but no water is coming out. The tank is full of water but has no idea why it doesnt come out. Grandma, as long as you're happy with using aluminum then use it. If you're adept at plumbing, then adding a bath should be no problem for you. 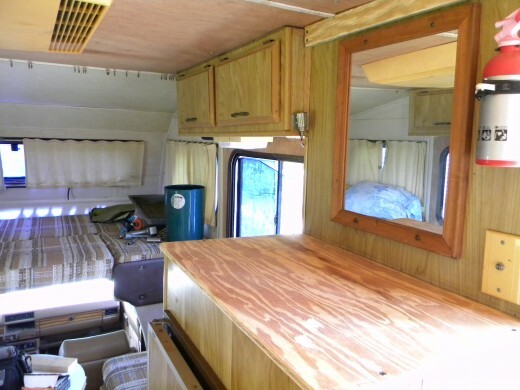 I will be picking up an old travel trailer soon and plan to totally remodel the inside. I would like to make it as light as possible but wonder if using aluminum instead of wood for framing up the beds and cabinets would be okay? It doesn't have a bathroom but I plan to add one. Do you think adding a bathroom is going to be a huge challenge? Patti, hard to do with seeing it personally. have a !988 motor home that has fire damage.we would like to repair it any tips? 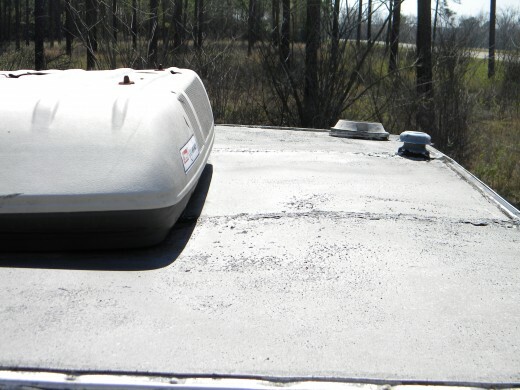 Sheila, some owners with stationary RV's use a metal shelter over the camper to do away with the rubber roof problem. I some cases it's more affordable than continually replacing and patching the roof. Julie, in this particular remodel we didn't have to remove the cabinets to redo the ceiling. Yours may be different. When u redone ur ceiling did u take out ur cabinets first? Im gone try and redo my 1978 Jayco J series ceiling myself. Thanx for telling and showing details on urs. Jean, you have the option of regular fiberglass insulation or you can use Styrofoam solid insulation, whichever is easiest for your application. I picked up a 1988 jamboree for 825.00 with water damage. What insulation would you recomend? David, you may have to rig some sort of jacks to lift the roof, but other than this idea, I have no clue. Sorry! How can I at least get this thing to raise up so I can see what I have inside? Larry, if you need some advice I'd be happy to help you. Richard, I don't understand your question fully. How to fix overhead bunkbed that has a sprin 1986 Winnebago? Ronald, you can find many different exterior materials online. You can use the Contact Author icon at the top of this or any other of my articles to email me pics and any questions you may have. Need help with the outside of my 63 Shasta + running the outlets and wires for the inside. For the age it's in pretty good shape. But I need help finding new skin for the outside maybe new ideas on remodeling the inside would like to have a shower in the closet toilet. Thanks! deedee, sorry I cannot help you there as I'm in southern Georgia. i have an 1971coachmen park model camper im looking for someone to come to my camp to refurbish it, do you know anyone in the Brookville pa area that does that kind of work. Joann, I have absolutely no experience with this type of waste disposal. Sorry! My husband and I are restoring a 1972 Holiday Rambler travel trailer, 28'. It has a unique sanitation system that I'd like to reactivate.It has a Thermasan Incinerator that uses the heat of my truck engine to "burn off wastes". Therefore, dumping the black tank is not necessary. I called Thetford, the company who produced the system, but they're no help. I need a Thermasan Control Center Module to use the system. Does anyone have any idea as to where I may purchase one? Hey Rodney, sorry to be so late in responding but the spam filter caught your comment. Tammy, I have no experience with either of these modifications, Sorry! 1997 5th wheel with slide out is it possible to cut off the slide out and it still be stable and also can the 5th wheel be removed and made into a bumper pull? Joe, you'll have to look online at RV supply companies to find what you need. It depends on your plans for replacing the present material. Can you recommend a place to buy aluminum for the outside as well as for the outside roof? Joe, sounds like you have a good plan for the rebuild. Only you can decide how much of a "pain" the project is. I've been told the same thing before and thankfully, I didn't listen. :) Let me know if I can help you. Thanks Randy. I'm afraid that if I gut the whole thing out all at once then it would not be square, so what if I start with the ceiling and once it is tore out, then add my cross beams. That way the walls will stay straight and even. Then I can do the walls, add the studs, then once that is done work on the floor? Some people I have talked to about this say to walk away from it b/c its a pain. But I've seen this model that has been renovated and its a beautiful vintage trailer. Do you think my plan will work? Any more advice? Thanks!! Joe, they were trying to save weight and money. Yes, you can add wall studs and rafters in the rebuild. Randy, Do you know why Winnebago made their ceilings (and walls) from Styrofoam and 1/8" plywood without using any cross beams in the ceiling? What is the best way to replace ceiling and walls? Should I add more beams and wall studs? I have a 1966 217 1/2 T. Thanks! Alyssa, you may be able to remove the framing around the window and not have to remove it. If not, it's probably held in place with screws and not difficult to remove. We are going to have to replace the luan walls in our bathroom or our 1990 Toyota Winnebago Warrior. Will we need to take the window out in order to do that? What is the process for removing if we need to do that? Thank you! Elizabeth. I have a 59 Serro Scotty and mine uses luan for the ceiling. I had another Scotty and it used plastic panels with flower shped buttons to cover the screws. 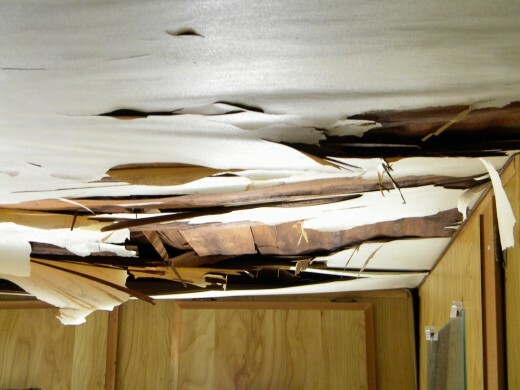 If yours has a similar ceiling material, you can find something at Lowe's or Home Depot. Look at Bath panels if you can't find anything in the ordinary paneling dept. Hi Randy, I have a 72 Serro Scotty that has water damage in the roof. Where can I buy this paneling to replace it? Yes, I've been reading about them but hadn't realized it could be ducted into the floor or roof....was just considering the window for both ducts. Have read where units will freeze up if both ducts are too close together so thought it might not work in the small bathroom. Maybe it will after all. Thanks again!